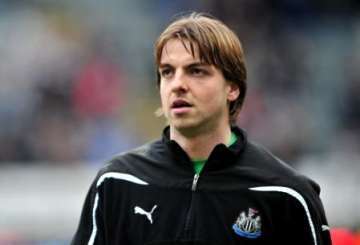 Tim Krul: An example to other youngsters? | NUFC Blog. With Tim having “matured” so to speak, we must look again to our youngsters to see who else we can promote through the ranks. I think it’s fair to say that the Toon will drop down the league as time goes on, so why not try and integrate a few younguns into the team if and when it can be permitted. Sammy Ameobi looks more dangerous than his brother ever did, whilst still providing the ongoing Ameobi comedy value. Haris Vučkić is ready to become our very own Jack Wilshere who hopefully can begin to step in when HBA is injured. Are we beginning to see the Ashley 5 year plan start to mature? With more investment into promising youth such as Mehdi Abeid, I hope that our rich vein of talent can continue to influence the EPL. These kids are hungry for their chance, and that hunger seems to have rubbed off onto the 1st team, something we were missing in our relegation season. Krul’s looking good, he still has a few things to learn, which will come with experience… I just hope we can keep hold of him, I’m not convinced by Elliot… I’d never even heard of him until we signed him, and a 25 year old ‘keeper playing in league 1, is hardly going to be special is he. Anyway, Krul’s doing well, long may it continue. Forster doesn’t look too happy in his latest pic Andy. It looks like Krul might be getting some more Netherlands caps thanks to Stekelenburg’s heed, which would bump his price up nicely. is capt. sensible really Juve’s scout? & does he really wanna end up like/as a buffant? He’s doing well Timothy, just needs to sharpen up his ‘coming & collecting’/punching by being a bit more decisive. But his distribution ie rolling/throwing the ball out rather than hoofing has come on recently. His kicking under pressure can be a bit wayward sometimes. He’s defo improved though. Overall I think we’re better off having a near world class keeper at the age of 23 as he’s less likely to want to move to the “big time” until he’s gained the confidence that will surely come within the next few years. If we’re winning games and maybe some silverware with a regular spot in Europe he should be happy. If we’re struggling then thats another kettle of fish ! Think we lucked out with young Krul. He naturally looked a bit shaky in his first few games, but with game practice, he has certainly impressed me. He has most of the requirements, height, athleticism, positional awareness, reminds me of Shay with some of his reaction saves and played a big part in our latest win against Wolves. Of course still not the complete article, but should be a real good stopper for us and solve our keeper needs well into the future. Now we all agree Krul is the real deal, what’s the general feeling about PARDEW ? Sure we know he has yet to find a subject he does’nt have to comment on, whether or not we can understand what he’s talking about. Some claim he is using psychology ! A few think he’s doing a hell of a job ! Others think he’s useless ! Does he have any actual input into who arrives at the club, or is he just an Ashley yes man ? Is he a good tactician ? Is he the man to lead this side to a successful future ? All opinions welcome and hopefully respected. ps…Krul will eventually leave shay trailing in his wake. Another good win for the reserves & interestingly, the reserves are actually the reserves again, for a change. youngsters won the other night! sorry, I know you all like a good whinge but I just can’t think of anything to complain about! oh, and we’re 4th ! £8m for Maiga ? I’m not overly excited ! he has 6 in 4 so far this season, even while being booed by his ‘fans’ for wanting to leave. It is the french ligue 1 like, but anyhoo.